The US$200 Speck combines a particle sensor and machine-learning algorithms to gauge the level of PM2.5 pollution in the air, which has been linked to disease. Developed by Carnegie Mellon University's Robotics Institute, the sensor can provide information allowing users to make decisions about indoor ventilation and whether to install air filters. 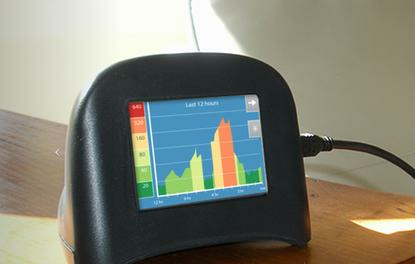 Researchers have developed a connected air quality sensor that measures fine particulate matter (PM) in homes. The US$200 Speck combines a particle sensor and machine-learning algorithms to gauge the level of so-called PM2.5 pollution in the air, which has been linked to disease. Developed by Carnegie Mellon University's Robotics Institute, the sensor can provide information allowing users to make decisions about indoor ventilation and whether to install air filters. The unit incorporates a tiny fan, particle sensor, color display and Wi-Fi connectivity so air quality data can be uploaded to a cloud server. The screen shows whether unhealthy levels of fine particles are present. The sensor data is hosted by CMU but users have control over how the information is shared. "People and communities need to take back control of their air at home -- and it's very, very difficult today to measure true air quality in the home and act on it," Illah Nourbakhsh, a CMU robotics professor who developed the sensor, said via email. Most home air monitors detect volatile organic compounds (VOCs) and carbon dioxide but not fine particulates, Nourbakhsh said, adding that the machine-learning algorithms are used to filter out noise from the sensor, which is relatively cheap. Fine particles have been linked to illnesses including asthma, chronic obstructive pulmonary disease (COPD) and heart problems. PM2.5 refers to particles less than 2.5 micrometers in diameter, about one-thirtieth the average width of human hair. Nourbakhsh pointed to a recent study by researchers from the University of Chicago, Harvard and Yale which found that fine particulate matter pollution is reducing the life expectancy of more than half the population of India by three years or more. In a trial, the Speck sensor was distributed to families in the area in and around Pittsburgh, Pennsylvania and one found that the sensor showed air quality was reduced when an air conditioner was on, exacerbating their daughter's asthma, Nourbakhsh said. Other alerts were triggered by construction or exhaust from a diesel generator. Pre-orders are being taken for the Speck sensors, which will begin shipping in April.